I am writing a lot of business documents in Scrivener, and even though it’s the wrong way to do it, I use Scrivener’s format presets (think paragraph styles) to quickly format headings, bulleted lists and paragraphs in each sub-document. This way I minimize post-processing (and the business format is intentionally boring so I do not need any fancy layouts). But it’s a hassle to have to take my hands off the keyboard to click through the Format / Apply Formatting / Apply Preset menu tree or hit the tiny format preset dropdown ¶a to set the current paragraph style. What I want is a single key-combination to apply a preset style. The first thing you need is to create the Format Presets you want to use. Select the paragraph you want to format. 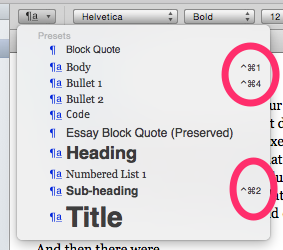 With the paragraph still selected, choose Format / Formatting / New Preset from Selection from the menus and give it a name. Make sure this name is unique to the application, this is key. You should now see the new preset with your name on the preset drop down and in the Format / Formatting / Apply Preset menu. To manually apply this preset to another paragraph, select the new paragraph and then click the new preset off the menu. Open System Preferences, choose Keyboard and select the Shortcuts tab. Click on App Shortcuts on the left. Type in the name of the format preset. Note: The name must match the format preset exactly, one character difference and this will not work. 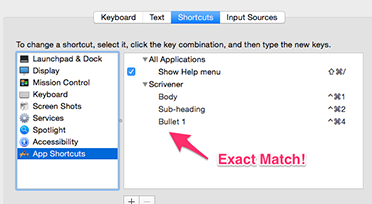 To see if this worked, click on the Format / Formatting / Apply Preset menu in Scrivener and you should see your new keyboard shortcuts on the menu next to their names. So now you can focus on writing in Scrivener and format paragraphs without leaving the keyboard.